Active Waste Solutions, Inc., is a family-owned business with over 35 years of experience in the Waste and Recycling industry. We are here to serve your waste disposal and recycling needs. Active Waste Solutions is the company to call when you want reliable, efficient, safe waste removal. We offer Residential, Commercial/Industrial, Roll-Off Dumpster and Construction services at affordable rates. Our uniformed personnel are always courteous, and our equipment is kept in tip-top shape and always ready to collect. We strive to exceed our customers’ needs; their satisfaction is our top priority. We take responsibility and ensure the safety of our team, community and the environment. We build long-lasting professional relationships based upon mutual respect. 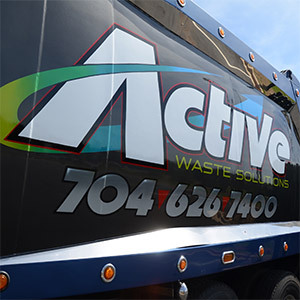 If you’re in need of weekly trash and recycling removal from your home, community, HOA, business or construction site, please call Active Waste Solutions today at 704-626-7400. Our friendly, knowledgeable staff can answer any questions you might have about waste removal and provide you with a free estimate. We look forward to serving you! We offer all-inclusive, competitive, affordable pricing for our customers; we don’t charge extra hidden fees, such as environmental fees. Our clients have direct contact with the management of Active, not a call center. All of our personnel are trained, uniformed professionals whose backgrounds have been thoroughly vetted to ensure the highest levels of safety and customer service; we do not send strangers to our customers’ homes or businesses. Our fleet of later model trucks are always clean in order to uphold the value of cleanliness in all neighborhoods and communities where we operate. We are committed to protecting the health and well being of the communities we serve. We handle your waste in an efficient, environmentally responsible manner. Pay your bill online with major credit cards with our secure bill pay system. We service all of the Charlotte metropolitan area including Cabarrus, Gaston, Mecklenburg, Union, and Anson counties in North Carolina and, Lancaster and York counties in South Carolina.